News on inclusive market. . . .
29.09.2016 (link): On the 20th of September 2016 we participated on the Conference on youth long-term unemployment in Brussels which was organized by the EPC. . .
19.09.2016 (link): Presentation for the EPC workshop on the 20th September 2016. . .
03.11.2015 (link): Presentation for the conference which takes place on 3rd-5th November 2015 in Bratislava. . . The objective of this activity is to give full picture of social system in Slovakia. The main goal is to start scientific discussion on the foundations, goeal and activities of social system which should be the base for legislation.. . .
15.03.2019 (link): Development of material need benefits in Slovakia in Slovak crown and in Euro. . .
03.09.2014 (link): On the 6th of November 2014, IZ Bratislava is co-organizing conference Inclusive solidarity – analysis and potential effects. . .
Online calculator, that calculates net income of a household in material need in case one of the members gets a standard employment. It calculates minimal wage, stipendiums, material needs benefits and all cash and services received from general government. Slovak version only.. . . Regional offices of labour, social affairs and family in Slovakia de-iure organize education of unemployed. Unfortunatelly, the volume of people in the education is very low, approaching only several permille.. . . Working man's dignity should be the basic determinant of the labor regulation. Experience of the Slovak labor market suggests that gradually creates a significant contrast between the declared and actual. In practice, because of occurrence of various malformations leading to avoidance or deliberate use of imperfections employment legislation.. . .
On our webpage, we have several data which are regularly updated. These include data on unemployment or legislation.. . .
18.01.2019 (link): Meal allowance for empolyees, with historical data. . .
14.01.2019 (link): Zuzana Havírová. . .
03.10.2018 (link): Counties of Slovakia with up to date unemployment rate. . .
20.09.2018 (link): Presentation for the SEAM conference in Bratislava about implicit tax rates. 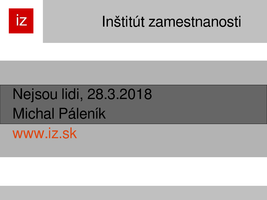 . .
24.02.2018 (link): IZ shows basic data and statistics on labour market in Slovakia. . .
01.02.2018 (link): Development of living and subsistence minimum in Slovakia since 1998. . .
27.01.2018 (link): Development of minimal wage in Slovakia since 1991 in Slovak crown and Euro. . .
09.11.2015 (link): The aim of this conference, which will take place on 12th November 2015, is to foster the exchange of ideas among scientists and professionals conducting research in the field of economic modelling of environmental taxation. The emphasis is on Input-Output modelling and CGE. The content of the conference will cover the potential of the European environmental tax as EU own resource. The conference is organiser under the framework of the upcoming Slovak Presidency of the Council. . .
22.05.2015 (link): Viliam Páleník, vice president of ECO section of EESC and president of IZ Bratislava organises conference A European tax as an EU own resource. Two members of European commission and members of European parliament attend this conference. . .
IZ Bratislava is independent non-government think-tank focused on labour market. 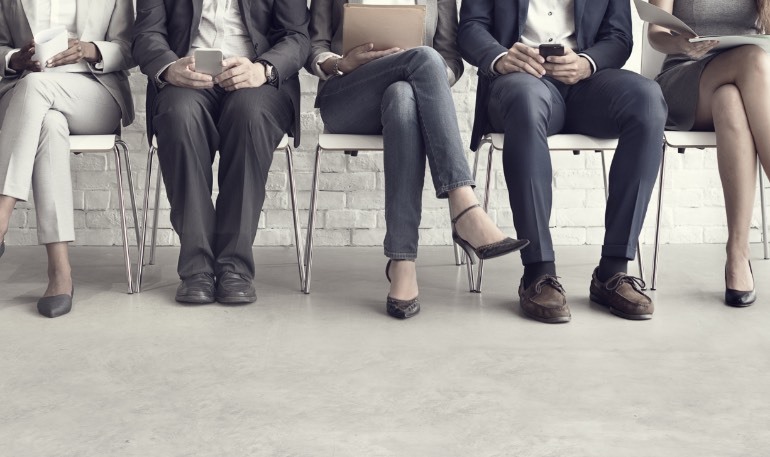 On our website, you can find description and aims of Employment institute, as well as information on our projects, our partners or you can contact us. If you have any questions, don't hesitate and contact us. Our website is in English as well as in Slovak language.